It comes as no surprise just to how far the Worldcon board members will go at this point in their abject hatred and harassment of conservatives. Many on the board have been directly responsible with stirring up internet outrage mobs against me, including Mr. Andrew Trembley, whose social media feeds are filled with toxic anti-Trump hate and not much else. There was a time in the science-fiction world when I was friends with Trembley on Facebook, only having positive interactions with him and his partner Kevin Roche (Worldcon Chair). That changed in 2016, when Trembley’s rhetoric kept increasing in calling Donald Trump’s supporters racists, Nazis, bigots, and a whole host of dangerous and false terms that could lead to harm of conservatives–and certainly led to the very public defamation that he and several other Worldcon board members harassed me with. Trembley took to personal attacks against me when I bravely voiced that I support Mr. Trump, standing up against the bully mob. I was met with derision and several “colorful metaphors” as Mr. Spock once put it. Mr. Trembley was quick with the F-word and pushing hatred of me just apparently because I was voting differently than him. But an anonymous fan sent a more recent post of his to me. What the Worldcon board doesn’t realize is that I still have a lot of mutual friends, they just don’t say anything because they know the way we get targeted if we speak out. It’s like a Soviet-style crackdown with these folk and it’s horrific to watch how they treat people who disagree with them. The commentary on civility is, timing-wise, in clear praise of the event where the Press Secretary, Sarah Huckabee Sanders, was thrown out of a restaurant for her identity. Trembley applauded this action because his team can’t get a win at the ballot box with his extremist ideology. So he posits that everyone has to go more extreme. Of course, he and the Worldcon board already treated me similarly over my identity, so of course this would be something he would advocate. The next part was more shocking, where he took First Lady Michelle Obama’s call for civility in political discourse, “when they go low, we go high,” and crassly changed it to advocate for violence against conservatives. How far will Worldcon go? Worldcon has issued a statement telling their attendees to hide from the protest, presumably so they don’t hear these messages, and hear how their board is harming conservative authors and voices in the community so this message can’t get out. We won’t let them intimidate us or stop us even in the face of their violent threats. 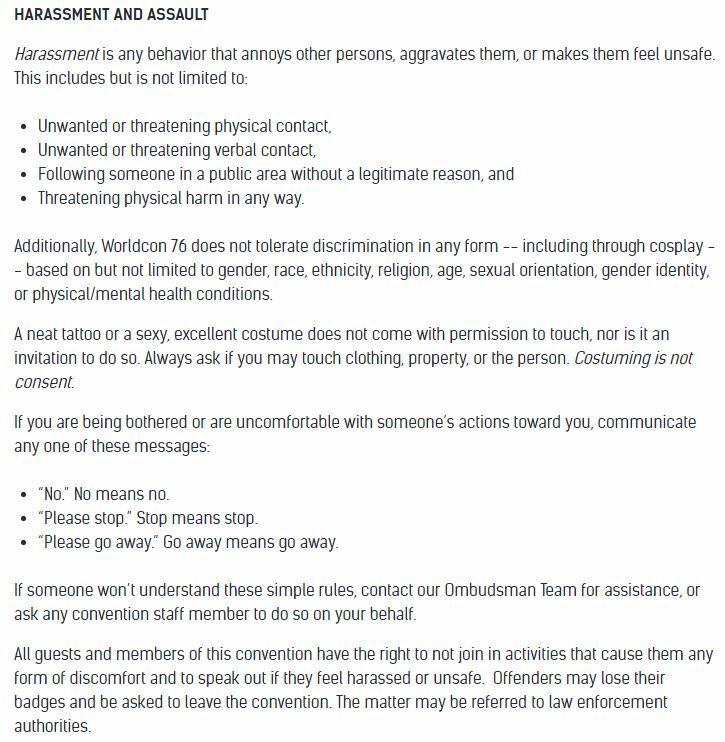 I will note that Mr. Trembley’s statement is a clear violation of Worldcon’s code of conduct, specifically in the harassment section where harassment defined as “any action that makes them feel unsafe”. It’s clear that no conservatives are safe around Mr. Trembley if he views physical violence as the only response to losing a debate. This being a threat of physical violence is also itself a violation of their code of conduct. Worldcon must ban Mr. Andrew Trembley immediately, especially with how aggressively they’ve chosen to deal with conservative authors. In the meantime, we must use our voices to peacefully protest this awful commentary by Mr. Trembley. Show up on Saturday, August 18th. And I hope you will check out my IndieGoGo, Flying Sparks and support brave authors who are willing to stand up against this sort of hate-mob mentality. Originally published on Jon Del Arroz’s blog here. Check out Jon Del Arroz’s newest book, For Steam & Country: Book One, available on Amazon now and check his blog, The Writings of Jon Del Arroz. Jon Del Arroz is a bestselling author on Amazon and is “the leading Hispanic voice in science fiction” according to PJMedia.com, and winner of the 2018 CLFA Book Of The Year Award. Jon writes science fiction, steampunk, and comic books, and can be found most weekends in section 127 of the Oakland Coliseum cheering on the A’s. He maintains a blog at delarroz.com. If you want fun superhero fiction without the messaging, check out his Flying Sparks comic series here!